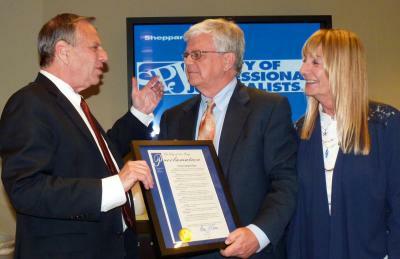 Terry Francke is presented with city proclamation from San Diego Mayor Bob Filner and Donna Frye, the city’s Director of Open Government. When it comes to open government and public access to government records, times have changed dramatically in California. Much of that change can be attributed to the tireless efforts of Terry Francke, General Counsel of Californians Aware. East County MagazineLast night, Francke received the coveted Sunshine Award from the Society of Professional Journalists in San Diego. The award was presented by Donna Frye, Director of Open Government for the City of San Diego and a prior recipient of the Sunshine Award. Mayor Bob Filner also presented a proclamation honoring Francke. Francke recalled how times have changed since he first became involved in advocating for open government back in the 1980s. View a video with excerpts of his remarks. His early efforts led to opening up access to the courts. Since then, he reflected, “The word transparency has taken on a currency which was simply not in the vocabulary back then.” Today, transparency has become a buzz word coveted by private, public, commercial and governmental institutions, said Francke. Now there is “an entire generation” that not only expects access to public records, but wants to see records easily searchable. JW August displays page from city’s Open Government websiteFrancke also leveled high praise for San Diego’s new commitment to open government, noting that Mayor Filner along with Frye have created an open government webpage where the public can access city records. “San Diego has gone beyond any municipality, certainly any municipality of this scale,” to make “overachievement an executive priority,” said Francke. Filner quipped that he still supports the Public Records Act—even after being deluged with records request three months into his mayoral term of office. August read a letter from State Senator Leland Yee, another past Sunshine Award recipient who could not attend due to a schedule conflict. Yee praised Francke’s successful efforts to fight for “a stronger Brown Act” and battling for government that is open and honest while standing up for the rights of all. Francke has a 31-year history of helping journalists, citizens and public officials understand and use their First Amendment and open government rights. With CalAware, he has authored guidebooks to California law, on access to government meetings and public records, and on the news gathering and publication rights of journalists. He has raised legal challenges to actions by the San Diego Supervisors and other local boards, with a winning track record of persuading government bodies to reverse actions done in violation of open government laws and enhance public access. Francke previously served as executive director and general counsel to the California First Amendment Coalition and as legal counsel for the California Newspaper Publishers Association. Prior to his legal career, Francke worked as a weekly newspaper editor, as well as holding military and local government public affairs positions. SAVE THE DATE: Monday, April 8: Who gets press credentials?